Social media integration has become an important part of modern web design. 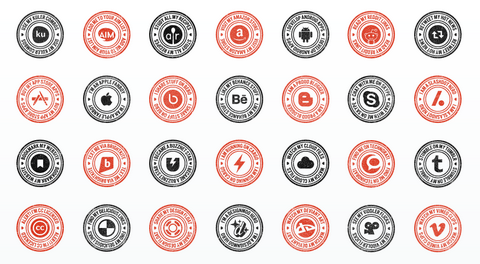 Web Icon Set has just released a set of free social media stamp collection to brand your work. All of them are highly recognizable by people. Social Media Stamp Collection contains 100 most favorite social services and applications. It includes PNG and PSD source file, so that you can change the color easily. You are allowed to use these icons in any type of project. And please don’t forget to share them with your awesome friends. Social Media Stamp is very beautiful and unique.